Do you have a Saboteur in your life? My friend Rachel scanned and emailed her Weight Watchers brochure on the topic after she read my post about supportive partners. While this is a similar subject, I think it’s an even more important topic to discuss because these types of people ARE out there. The Paranoid Partner: They think you’re going to leave them when you get “skinny”. 1. Be honest with them. Tell them what you’re trying to do and ask for their support. 2. Get it “To Go” and then don’t eat it. 3. Have a small bite and tell them how great it is. Then STOP eating it. 4. Reassure your partner or friend that the relationship is not going to change when you get healthy. Invite them to join you in the journey! 5. Tell them how important it is to you to get healthy. 6. If the relationship is truly toxic, limit your exposure to them the best you can. QUESTION: Do you have any other suggestions for dealing with these situations? 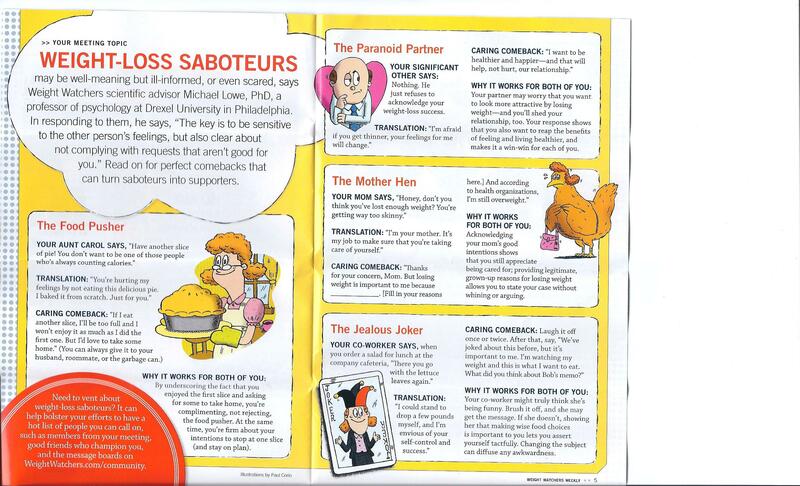 Do you have a Saboteur in your life? I TOTALLY had the “Paranoid Partner” that thought I would leave him after I lost all the weight….why I have no idea as my husband has been a body builder for over 10 years and is in excellend shape, but he did then and now that I am looking better each day I find that he says things the imply sometimes that he is worried about that still! P.S. I also have the “Mother Hen” too………as a lot of my co-workers & even my mom had made comments about be getting too skinny or saying things like you want to lose more, why!?!?! Some of my co-workers are that way too. They always let me know when someone brought bagels or donuts. I used to worry about this, but now I am trying to go with the it is not my issue mentality. I think that when most people do this, it is because they are not happy with their own choices or lifestyle. I just try to smile and say no now. I am a grown woman and I don’t want to feel that I have to defend my choices. It sounds rude, even as I type it, but it is the truth. Very Very Wise! I learned that lesson the hard way. I had a friend who wasn’t happy with my changes and we grew apart. For awhile I beat myself up and asked “what did *I* do?” But then I realized that it was all her issue, not mine. I think sometimes I am just my own sabatoeur. My family is very supportive of me. Aw yes, the good ole “fat talk” we all do to ourselves! I’m guilty of that too. I used to have to deal with this a lot (and sometimes still do) but most of the people I interact with on a regular basis are used to my healthy ways and supportive of the lifestyle, so luckily don’t push food on me. I do have a lot of people ask how I can be so good all the time, but I feel like I am very balanced and have my fair share of splurges.